Currently spirituality looms large in our western culture. A few decades of New Age activity, the postmodern shift away from religion as merely a system of concepts and the longing of the human heart thirsty in the wasteland of modern technology all converge to make the spiritual a point of focus. It is interesting to note how art and the spiritual are being linked in the process. This connection is not new but is certainly worth attending to. Promoting the arts in the context of faith, as Imago seeks to do, provides a ready opportunity to make the connection between art and the spiritual. But this is an area where lines get rather fuzzy as there is a veritable marketplace of spiritualities out there. One of the best known efforts to make the link between art and the spiritual is found in the work of abstract painter Wassily Kandinsky (1866-1944). This Russian born artist was a pioneer in non-representational art, a form he thought could best express the spiritual. In 1912 he published a small 50 page book titled Concerning the Spiritual in Art – a work still in print. I like Kandinsky’s paintings, the splash of colour, the energy and movement. At times it is as though he is painting music. 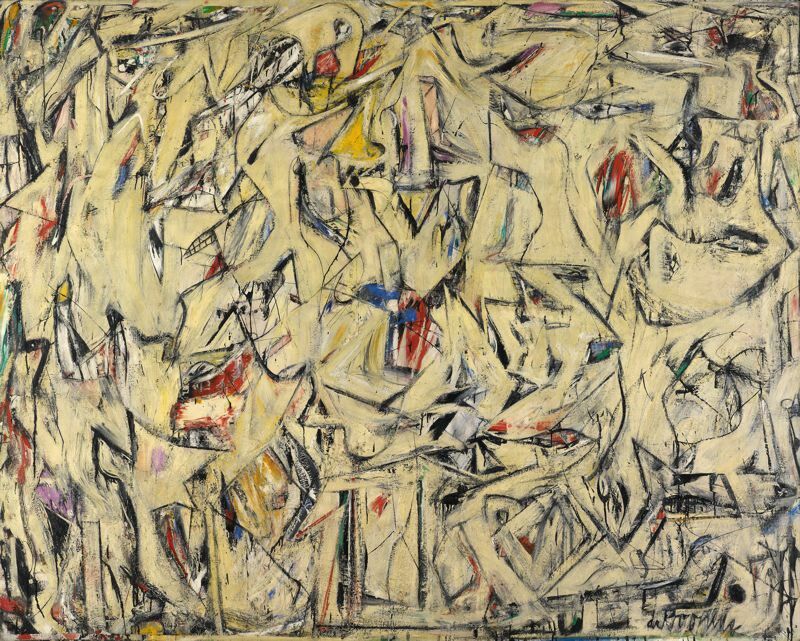 It has been said that abstraction was the primary visual language in the 20th century for artists concerned for the spiritual. 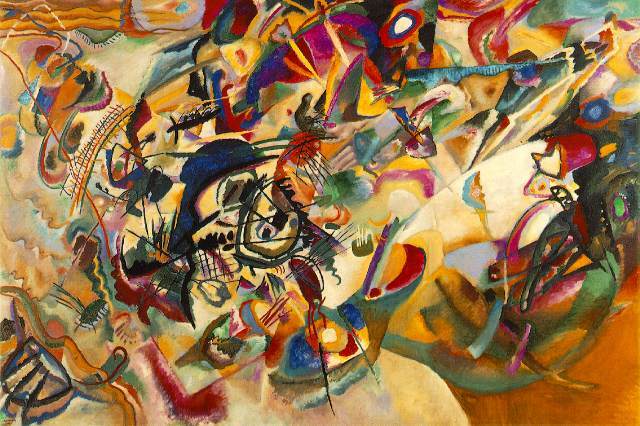 Interest in Kandinsky’s work is well sustained as is evident in the recent exhibition of his paintings at the Tate Modern in London England, The Path to Abstraction – 1908-1922 (until October 1).What about this fuzzy terrain of the spiritual? The nature of the spiritual for Kandinsky was determined by his adherence to Theosophy. This could be characterized as an optimistic mysticism, confident in a human ability both to bring harmony to our chaotic world and to shift us to a new level of spiritual experience – and for Kandinsky art was the means to that end. There is a Romantic thread in this view, an idealism that invites humanity to shape its own destiny. It soon becomes evident that art takes the place of religion – or perhaps becomes religion. This is a risk that we often hear voiced when having discussions about faith and art. And there is no doubt that art has a power to draw us in and take the place ofreligion. We find that we are nurtured by the imaginative in a spiritual sort of way. And we can believe that what we experience through art captures the essence of the spiritual. This enclosed human-centred notion of the spiritual falls well short of a Christian understanding. At the heart of the gospel is a call not to turn into ourselves so much as to turn out toward the One in whom the fullness of God is manifest. In this context art can be seen as The spirit that will lead us into the realms of tomorrow can only be recognized through feeling – Kandinskyan illumining presence casting light for us so we are able to see a little better and a little more. The eyes of faith are able to discern in the arts a value that enriches life and affirms God’s good creation all of which calls us to gratitude. There is something else about Kandinsky’s notion of the spiritual I find troubling. It is an understanding of the spiritual that negates the physical. It is the spiritual disengaged from the nitty-gritty of ordinary life. It echoes ancient Gnosticism – a view still popular that disparages material creation and opts for disembodied spirituality. For Kandinsky it was an escape from the materialism of the 19th century that drove him to this resistance to the material world. Art was seen as the best vehicle to directly move the human soul. However when one considers for example, the works Canadian artist William Kurelek, British painter Stanley Spencer or the French artist Georges Rouault, one discerns a earthy sense of the spiritual. A sense, I would contend that is more consistent with a biblical understanding of the world, one that affirms creation as good. Though these artists give us religious content in some of their work, it is free of religious cliché and deeply connected to ordinary life. The idea of escaping this material temporal world is- it would seem more – indebted to Greek philosophy than to the biblical narrative. This same understanding of the spiritual , as disembodied, has played havoc among those of more conservative theological persuasion – and resulted in a diminished place for the arts. In this case the argument is just the opposite of that given by Kandinsky. Whereas Kandinsky wished to affirm art as a key in awakening and enriching the human soul setting it free from the temporal and material world, those with conservative theologies contend that art is too earthy, all too human and so does not fit with the call to cultivate a spirituality which speaks only to the needs of the soul. Though I have mentioned only Kandinsky among abstract painters, others who adopted this genre include Willem de Kooning, Mark Rothko, Jackson Pollock and Barnett Newman (Abstract Expressionists) all of whom would affirm the special spiritual capacity of artists. Not all held to the notion of the spiritual adopted by Kandinsky, but all were convinced that art and artist were engaged in a saving work. This may be understandable in a century burdened by the ravages of war and an ever increasing marginalization of religious faith. But the weight of human salvation is something art is unable to sustain. Art fails as the sole resource for the spiritual and it falls far short as a substitute for religion. Spiritual life rooted in the biblical narrative adopts a very different account of human salvation but the journey of “working out our salvation with fear and trembling” can be greatly enriched through art in all of its forms. That there are links between art and the spiritual is evident, but for Christians the foundation for spirituality is not centred in the works of human imagination. Rather spirituality is to be informed by the great drama of the biblical narrative that both sustains the church and is intended to infuse the lives of those in the faith community. Art too must find its place in that larger story by which we are called to live.